rock & roll the Arthur’s Day stage with 5 Hours of pure ‘live’ music! 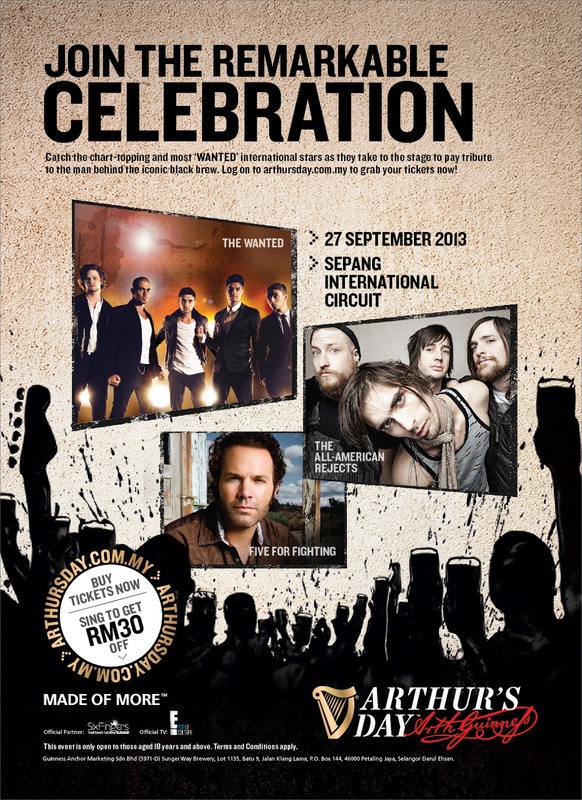 Arthur’s Day™ 2013 proudly introduces: Five for Fighting, All American Rejects and The Wanted! These music icons are set to take centre stage this Arthur’s Day™ with 3, 1 hour 15 minutes ‘live’ performances respectively; giving fans 3 international music concerts rolled into one remarkable celebration - Arthur's Day™ 2013. Want to know how to get your hands on some tickets? Here's a complete guide for you Arthur's Day fans out there, just so you can be sure to get your hands on some tickets and be part of what's set to be the most epic Arthur's Day celebration yet! Your guide to all things Arthur's Day 2013 at arthursday.com.my! On top of that, in line with this year’s theme, “honouring those who make bolder choices”, GUINNESS® invites you to be bold, step up to the play and sing your way to some awesome discounts! Visit www.arthursday.com.my, click on the “sing for discounts” tab, sing your heart away with this year’s rocking artists and stand a change to get up to RM30 off your ticket purchase. 3 International music icons, 5 hours of pure ‘live’ music and a global scale concert, Arthur's Day 2013 is set to be one of the biggest and boldest celebration yet! So don't miss out and see you at Arthur's Day 2013 on 27 September 2013 at Sepang International Circuit! Log on to www.arthursday.com.my or www.facebook.com/guinnessmalaysia for more information.